The Ravens own a glaring need at the receiver position. They signed veteran Seth Roberts to a corps of Willie Snead, Chris Moore, and 2018 draft picks Jordan Lasley and Jaleel Scott. Baltimore currently doesn’t have a headliner in the group. Could the new Baltimore bass use a top pick to secure a potential game-breaker for a ground-focused offense? At 6-foot-3, Metcalf owns the physical trait scouts drool over, displaying a rare combo of speed and size. 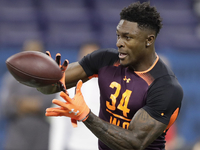 NFL.com draft analyst Lance Zierlein compared Metcalf’s ability to the on-field traits of Josh Gordon. 2. Ohio State receiver Parris Campbell is visiting with the Cincinnati Bengals, Rapoport reported.